Co-authored by Coventry University’s Open Media Group and Mute Publishing as a critical experiment with both collaborative, processual writing and concise, medium-length forms of attention, Open Education: A Study in Disruption explores the disruption of the traditional university as a result of the increasingly widespread provision of free online open education. What for decades could only be dreamt of is now almost within reach: the widespread provision of free online education, regardless of a student’s geographic location, financial status, or ability to access conventional institutions of learning. But does open education really offer the openness, democracy and cost-effectiveness its supporters promise? Or will it lead to a two-tier system, where those who can’t afford to pay to attend a traditional university, or belong to those groups who prefer not to move away from home, will have to make do with a poor, online, second-rate alternative education produced by a global corporation? Open Education engages critically with the creative disruption of the university through free online education. It puts into political context not just the 2012 batch of extremely publicity-savvy MOOCS (Edx, Udacity, FutureLearn etc. ), but also TED Talks and Wikiversity along with self-organised ‘pirate’ libraries such as libgen.org and aaaaarg.org, and ‘free universities’ associated with the anti-austerity and student protests and the global Occupy movement. Questioning many of the ideas open education projects take for granted, including Creative Commons, it proposes a radically different model for the university and education in the twenty-first century. An exceptionally lucid study of actually existing practices of ‘open education’, this book is also a passionate call for proactive experimentation with emergent media technologies and forms of collaboration that might yet generate a radically different idea of the university. 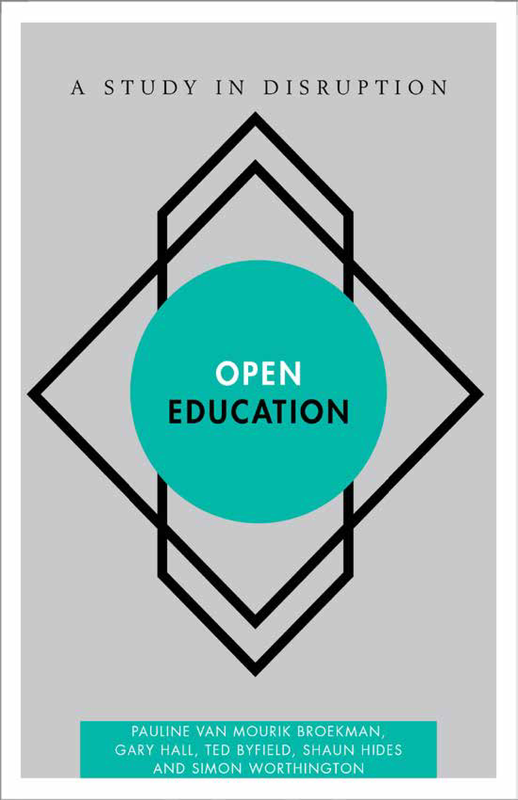 Sober, critical and energizing in equal measure, Open Education: A Study in Disruption is an indispensable guide to those forces of creative destruction that are currently transforming the academy. It should be read by anyone working or studying in contemporary higher education. In a refreshing change from the simplified (and shallow) treatment in popular media, the authors unveil the layers of complexity needed to truly address the concepts of “Disruption” and “Open Education”. While it may contain more questions than answers, this is a critical step in looking beyond strategies of solutionism. Grounded in a consideration of the societal, economic, and cultural influences on the future of higher education, combined with the practical experience of Coventry University, this book will be foundational for any institution that wants to have a hand in crafting their own future. Open Education aims at starting new conversations, encouraging a thoughtful engagement with its subjects. Open education emerges through this text as a space of possibility, and opportunity, but also a space which demands an ethical, critical approach. Pauline van Mourik Broekman is co-founder, Mute, and Mute collective member. Gary Hall is Professor and Director of the Centre for Disruptive Media at Coventry University, UK, and visiting professor at the Hybrid Publishing Lab – Leuphana Inkubator, Leuphana University, Germany. He is also co-founder (in 1999) of the open access journal Culture Machine, a pioneer of OA in the humanities, and co-founder (in 2006) of Open Humanities Press, which was the first open access publisher explicitly dedicated to critical and cultural theory. He is the author and editor of several books on digital culture and the idea of the university, the best known of which is Digitize This Book! : The Politics of New Media, or Why We Need Open Access Now (Minnesota University Press, 2008). Ted Byfield is a New York–based independent researcher and writer. He served for over a decade on the design faculty of the New School University, and is a former visiting fellow at Yale Law School’s Information Society Project. He co-founded the Open Syllabus Project research network, and since 1998 has co-moderated the <nettime> mailing list. Shaun Hides is Head of Department of Media and Co-director of the Disruptive Media Learning Lab, Coventry University, UK. He authored the Department’s Open Media strategy, led a JISC-funded OER project on open-connected teaching innovation and has spoken at numerous events on OER, Innovation and the impact of disruptive technologies on education. He is an advisor to the British Council. Simon Worthington is a Research Associate at the Hybrid Publishing Consortium – Leuphana Inkubator, Leuphana University, Germany.